There are several contents that have the ability to randomize the questions E.g. Question Set. The Flash Cards doesn't have the capability yet. Please head over to the Feature Request forum and post your suggestion there. This way it will be more visible and will have a higher chance of getting implemented. I was hoping to do this (randomize/shuffle flashcards) as well...Was there never any reply? Love the idea of the product, but having trouble making it work. The installation went smooth, everything is showing up as expected except when I click the drop down to select an interaction type, I get the error message "Couldn't communicate with the h5p hub, please try again later". I'm assuming this is because of my institution's firewall settings on the server I am hosting the content on. Will I need to manually download the example interactions, upload them on my server and then work from there, or is there a libarary file that contains all the interactions that I can upload and work from? Can you ensure that you have the php dependencies needed on the server, that was listed on this page. 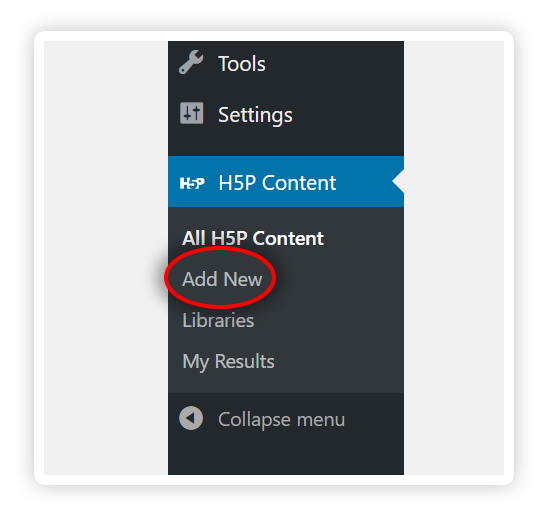 The easiest way to upload content types, is to just grab some content (press "Download" underneath it) from h5p.org, and upload it to your server. If you grab Course Presentation, it depends on so much, that you get almost all content types. (h5p.org is also updated with the latest versions of everything). I'm sorry, once imbeded the video cannot be downloaded separately from the content. Dear h5p, Sorry but I can't activate the plug-in ; here is the message : Parse error: syntax error, unexpected T_FUNCTION in /home/........./www/wp-content/plugins/h5p/h5p-php-library/h5p-default-storage.class.php on line 214 /// do you know this trouble ? thanks for youre time and youre very great work ! how can a language be added to the plug? is there any documentation to help with this? This documentation is a good place to start. H5P on Worpress - follow users? Is there a way to create or link to user accounts for students enabling the usage and tracking of H5P content like in Moodle for the Worpress installation? This should be possible, H5P emits data in the form of xAPI statements and you will need a plugin or custom code to listen to these statements and a data store such as a learning record store to save them in. Thank you for creating this and making it available. I use it for my education site. You are welcome. We are happy that H5P is reaching more and more students and teachers around the world. I'm afraid this is not possible by just using H5P contents. You could of course use a combination of audio and audio recorder. Although the recorder will only allow you to download the recorded file not save it only, you could of course create something in your site to upload the recorded audio. 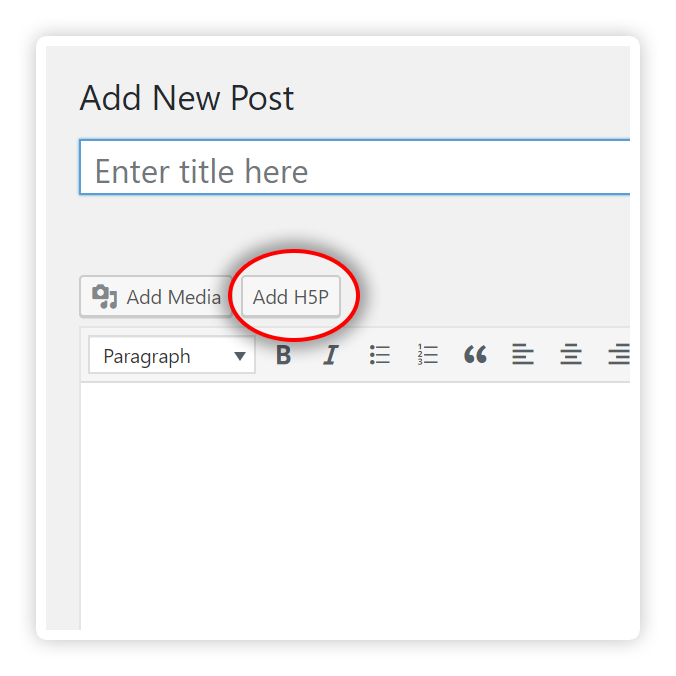 I'm using H5P in Wordpress via the plugin and so far so good. Per the instructions, I see that the only way to share the stuff you create (share in the sense that you have people use it) is by publishing the content in a post or new page. However, I want to collect scores, etc and individualize it (e.g. your name, email and quizzes taken + their respective scores, etc). How can I do this? I know there's an LMS plugin for wordpress called Namaste, would that work? Any advice and/or suggestions would be welcome. Many thanks and keep up the good work. You can also check out H5PxAPIkatchu. Have you already checked our repositories on github? Hi. I don't have a nice "Add H5P" button when I create a post. I'm guessing this is because I have a more recent version of WordPress that uses 'blocks'. I did manage to get my H5P content into a Post by using embed code: is this a clunky workaround or is that basically all the 'Add H5P' button does? I think this thread can shed some light on your concern. You may have disabled the Hub by accident when it popped up for the first time. To check this go to settings->H5P->put a check on "Use H5P Hub". I have reviewed the configuration and that option is checked. I have unchecked and checked it again but there has been no change. Your PHP max upload size is bigger than your max post size. This is known to cause issues in some installations. Do you still want to enable the hub? " I'm glad this is working for you now. If you have any other questions feel free to post in the forums. When using the Wordpress toggle feature we are unable to get the videos to properly display. They seem to only display the top of our video. Inserting content after the video did not fix the issue. Suggestions? Would you mind posting a separate report here, please follow the suggested template in that forum.